OOTD- Red for Lovers Day! OOTD- Black and red flowers! I tried that dress on the other day and I have to agree - worst name, most comfortable dress! I didn't end up getting it because my store had a large stock and I was already getting the Network Dress, but if it gets a second cut I'm all over it! I love mine and will wear it alot. It would be agood dress to wear for traveling too. This is quite possibly one of my most favorite outfits on you!! Adorable bow necklace and cardi as well!! Yayyyyy for polka dots and super cute tights!!! 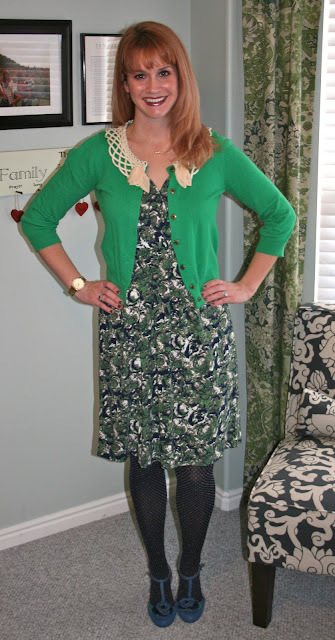 The whole outfit looks great together...that cardigan goes with the dress perfectly! And everytime you wear those tights I want to go find some look-a-likes...they're so cute! And I hear ya about Emily...she may be too good for Brad for sure. I think he loves that she's where she is in her life more than he might actually like her...who knows. I'm not really sure which I like best for him! I need that dress to go on 2nd cut so I can get it. It looks great with those shoes! Sometimes I wonder who comes up with the names for Anthro's items. Some of the names are AWESOME, and some, like this one, are so "Huh??" I love how it looks on you though, and with the bright green cardigan and adorable shoes, this is a real winner! The names Anthro have been coming up with have been a bit tired. I wonder if the original team left and they got a bunch of new people who are just recycling what the old team did. Green is a great color for you, especially against your hair! It does look like you belong in a woods! haha..that is a horrible name. but what a wonderful husband to get a beautiful dress for you!!! i have those tights..i love them to death. ok, you look seriously adorbs (short for adorable) in this dress!! Love the look Tricia! Count down to vacation yet?? here is something funny - when i read your blog ava loves to sit on my lap and say "ooo!" at your pictures and when you have a shoe picture she says "shoosh!". i love it. and you can add ava as another fan of your blog. I love the combination of pieces and shades of greens and blues! Fantastic outfit!